Day 2 of my adventure with Liberty Bell Wanderers is off to a great start. We finished yesterday by walking into Canada for dinner. We ate at a touristy little cafe near the falls, the Secret Garden Restaurant. I had an eggplant sandwich that blew my mind. It was fried, but only lightly breaded and served on a thin and fluffy ciabatta role. What made it deliciously wonderful was a layer of roasted red peppers instead of cheese and red sauce. One member of our party is gluten free and had a really nice burger on a pretty gluten free bun. But Gayle has the luck… She ordered vegetable stir-fry. It came out as a plate of spaghetti with red sauce, a large grilled tomato on top, and various steamed vegetables surrounding the plate. It was the oddest looking dinner I’ve ever seen. Speaking of Gayle, I mentioned to the American border officer that Gayle had a blank passport, so he stamped hers. Breakfast at the hotel, Hampton Inn on Rainbow Blvd, was amazing. Bagels, yogurt, cereal, make-your-own waffles, fruit, muffins, cheese omelette, French toast, oatmeal and toppings, and the most delightful smoked maple sausage. And multiple varieties of coffee. We headed out to Buffalo, with “Shuffle off to Buffalo” playing on the bus. 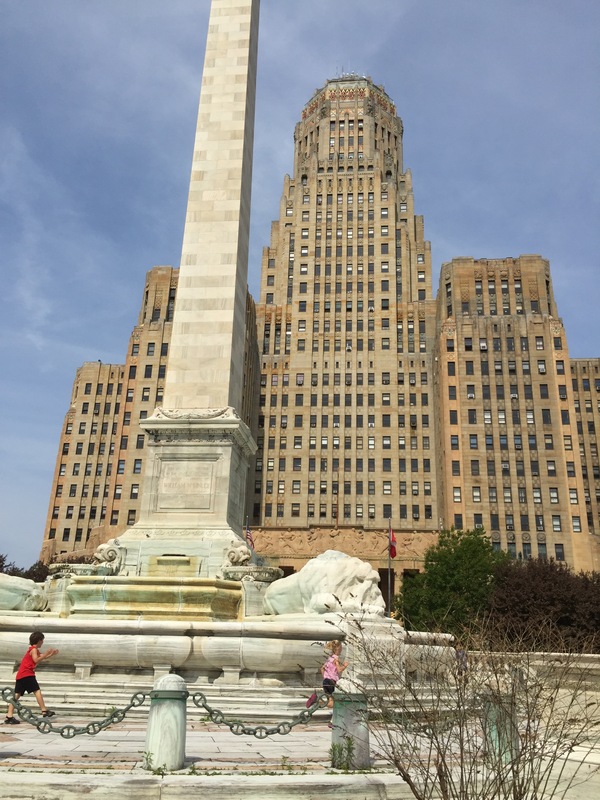 Buffalo is quaint, a gem of architecture, yet a city. The train travels up and down Main Street. The architecture features everything from Victorian to modern. The Art Deco lines of city hall make it one of the most fabulous buildings I have ever seen. The military park, the Erie marina and the restoration of the canal offerings a pleasing and fun way to experience history. And the downtown smells like honey nut Cheerios because they manufacture them here.